Some say the Friday competition is an appetizer for the Saturday festivities known as 2A and 3A. However, Class A has always been the firestarter for the Top Times meet which always brings out the best in the athletes. It was a virtual unknown by the name of Makail Stanley (Jr., Argenta-Oreana) that stole the show in the 60m. Stanley has a solid resume playing football and wrestling. He also took third in last year's 400m final. But still, it was a major surprise watching him overtake heavyweights such as Tate Walcott (Sr., Ridgeview) and Aidan Laughery (Fr., Gibson City) in the 60m. Stanley blitzed passed the field in a big personal best 7.03... Laughery would get revenge- sort of- in the 200m against club track mate and 300H specialist Mason Barr (Sr., Ridgeview) running 22.67 for the title... Stanley would take third in the 400m running 52.18... Barr earlier earned the 60H title in 8.25. Negus Bogard (Jr., Robinson) earned a split decision in the distance arena. 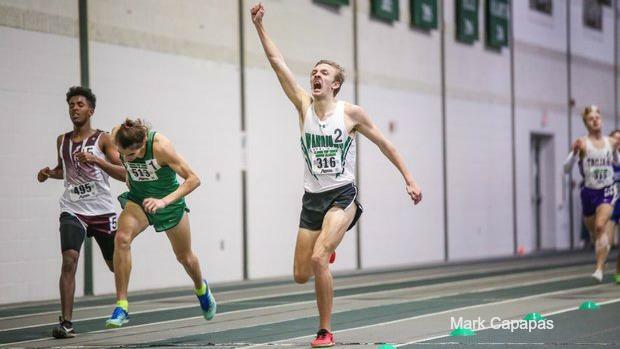 First up was the 3200m where the first mile was set up by Miles Sheppard (Fr., Warsaw) in 4:48. Bogard drafted with the leaders and finally taking the lead with 300 to go and in 9:34.12. It was another tactical affair in the 1600m in which Bogard was glued with the pack. But this time Noah McIntyre (Jr., Athens) made sure that he would be in a position to call the shots. McIntyre sprinted home for the win ahead of Christopher Collet (Sr., Seneca) and Bogard in 4:33.66. Collet's 4:33.68 beat Bogard who clocked 4:34.02. The relay action was dominated by a group of youngsters from Morrison. The Mustangs won the 4x800 (8:16.57) 4x200 (1:34.43), and 4x400 (3:32.17)- all in classification top marks to conclude the indoor season. If there was any athlete who electrified the crowd, it was Jorden Tedford (Sr., Warrensburg-Latham). He is a relatively mild-mannered young man until he gets inside of the competition ring. Tedford won the long jump competition over a slew of 6-4 competitors but the fieldhouse wanted more as he cleared 6-8. The bar was raised to 6-10. By then his legs grew tired but the smile on his face and the impression on the crowd left an indelible mark. The state leader in the long jump, Walcott, continued his mission by winning the title with a 23-0 effort- almost a foot better than Jacardia Wright (Sr., Decatur St. Teresa). It was easy money for state's top pole vaulter Kyle Kruthoff (Sr., Erie) who has cleared 16-4 this season. He only needed 15-6 to get the job done today. 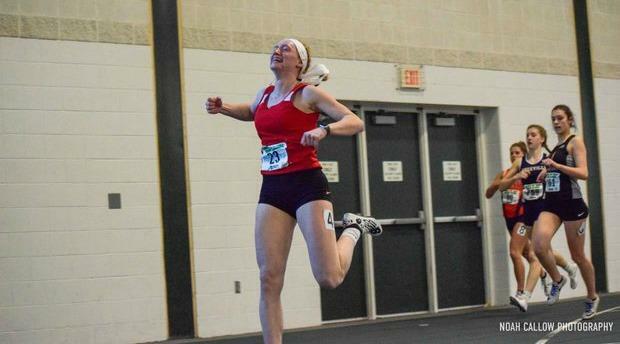 It was the Kenli Nettles (Jr., Arthur) show as the future collegiate heptathlete gave us a glimpse into her future. Things started in the high jump where Nettles and foe Daelin Switzer (Sr., Decatur St. Teresa) both had to compete in multiple events. Nettles won her 60H and 60m prelims and zipped back to the jumping pit. She was able to clear 5-6 and leave the chance of Switzer coming in and stealing the title, but tired legs from a result of running hurdles and a blistering leg on the 4x200 relay all but gave Nettles the victory. Still, it was 60H that Nettles excels the most in. She won in 8.94. A short time later she finished second in the dash to defending champ Janiya Collins (Sr., Madison) whose 7.91 was a season-best. Lastly, Nettles completed the grueling day taking the 400 crown in a class-best 58.73. The distance races were all tactical affairs. The 3200m saw Ailey Mitchell (Jr., Shelbyville) enjoyed a comfortable pace early one before separating from the group and winning in 11:29.01... Delanie Dykes (Sr., Gibson City) sat off of a 68-second first-half pace to win the 800m in 2:21.70... Fran Hendrickson (Jr., St. Thomas More) got her first 1600m title over a similar fit field running away with the win in 5:21.30. Though it was a win and not her best effort, US#1 shot putter Chloe Lindeman (Sr., Fulton) admitted it was very difficult competing against herself. She won by four feet and toss the steel ball 46-8.5. Windsor Roberts (So., Tri-Valley) thrilled a sizable viewing public in the pole vault to tie her season-best at 12-6. She was able to attempt 12-9 where one clearance was almost ruled a make but the bar fell off nearly four seconds after she landed on the mat. There was some controversy regarding the situation as well as a few internet pundits weighing in.